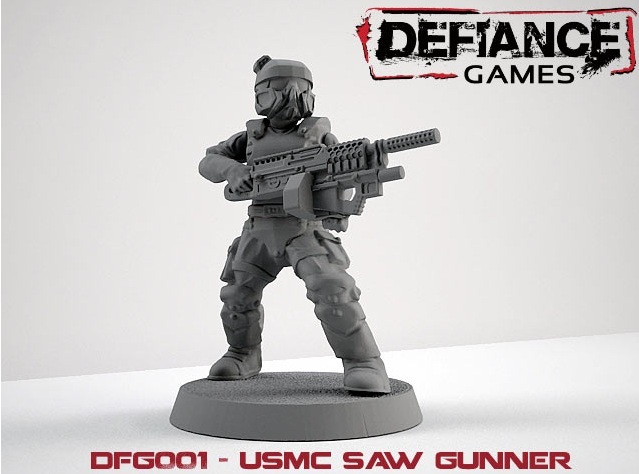 Defiance games has some cool looking futuristic human soldier on pre order! The design is very promising, they are quite similar to "close" future marines as seen in Aliens or Battlestar Galactica, if you are looking for some cheap and interesting Imperial Guard replacement you should take a look at them. By the way it seems that they will be released on Jan 12, more info at the official website. Having painted two out of the three 3D prints, and seeing all of the bits that will be on these frames, I can honestly say that these are seriously worth it. Also, at $30 for twenty four, they're a steal. The Germans and the Bugs will be out soon after the basic USMC infantry, and USMC heavy weapons, Hardsuits, and female infantry are following close on their heels. I've seen the German renders, and they are looking awesome. Same with the Bugs. I usually don't care much for bugs, but I'm definitely going to end up with a box of these guys when they come out. The rules that Howard has been working on are looking to be pretty easy to understand, and very flexible. It scales well from a small game using one squad each up to having multiple squads (that can all subdivide into elements as small as 1 model) like you see in other games. The infantry rules are supposed to be available on their site shortly after the models go on sale. They are distinctly a near future sci-fi game with believable technology.